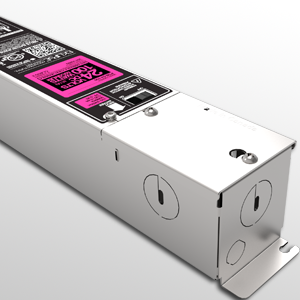 The PSB is an advanced power supply for architectural LED lighting systems. It is available in many constant voltage options: 12V, 15V or 24V. It is also equipped with a primary cut-off switch for easy onsite installation and features a segregated wiring compartment for easy and safe installation. Heavy duty galvanized steel case for a compact design. Isolated electrical compartment for wiring to primary. Extra electrical knockout for wiring in parallel. Convenient primary cutoff switch. Approved to CSA/UL & CE Standards.